After checking into my hotel in Campinas, Brazil I couldn’t wait to start exploring the grounds to see what insect life I might be able to find. 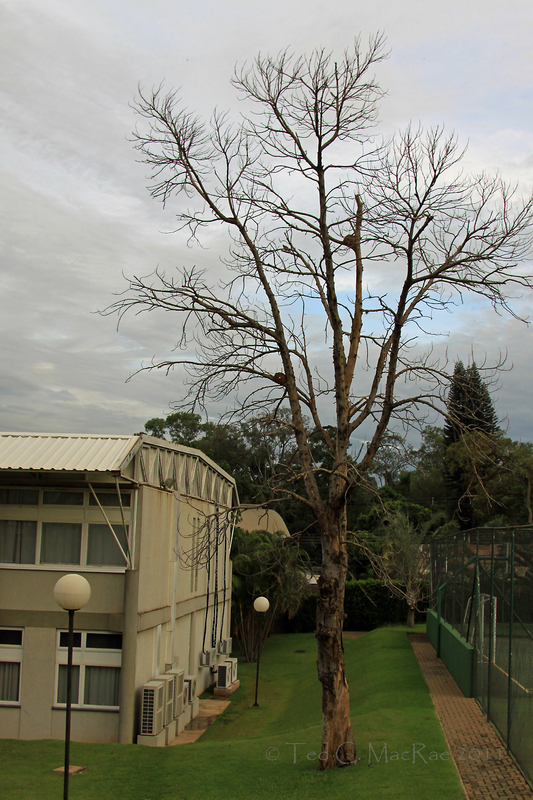 Almost immediately, I encountered this dead tree in back of the hotel. To a beetle collector, a dead tree is an irresistible draw – especially one that is still standing and with loosely hanging bark, as in this one. I approached the tree, gave it a look up and down the trunk to see if any beetles or other insects might be found on the outer surface of the bark, and when none were seen began carefully peeling sections of the bark away from the trunk. Out from beneath the first section darted a small, black lizard – it reminded me in general form of our North American fence lizards (genus Sceloporus), but honestly it darted so fast up the trunk that I didn’t get a good look at it (much less even the chance to attempt a photograph). Peeling the bark further away from the wood revealed a goodly number of what I took to be beetle larvae, although they were unlike anything I’d ever seen before. 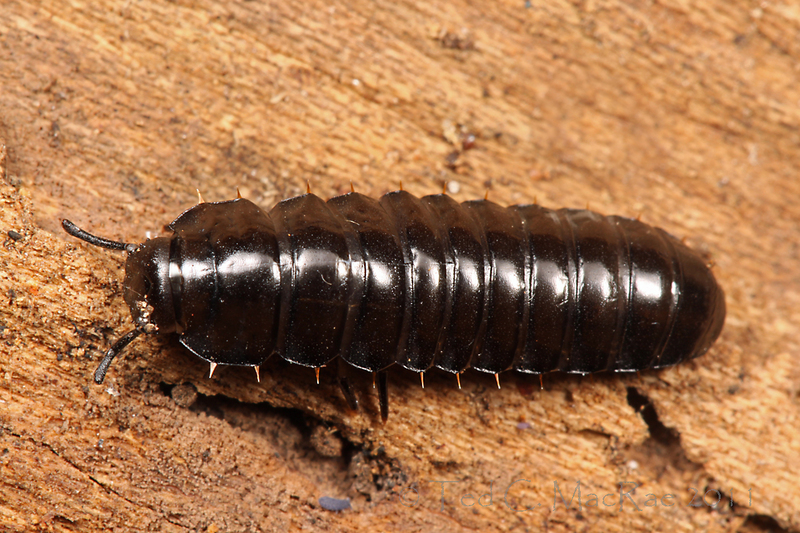 They were fairly good-sized – about 25mm in length, and although there are a number of beetle families whose larvae may be encountered under the bark of dead trees, there aren’t many with larvae of this size. 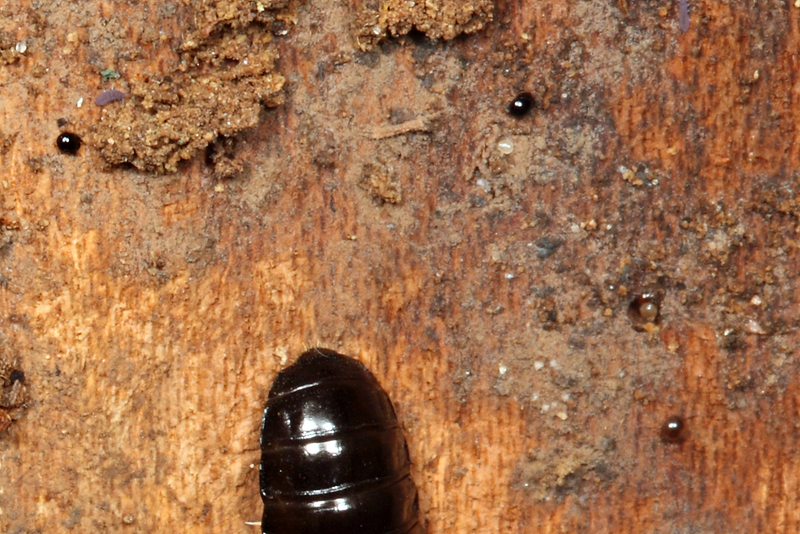 Coleopteran larva (Tenebrionidae?) under bark of dead tree. ¹ Insect collecting permits are required in Brazil and are exceedingly difficult to obtain. Although enforcement is lax, a few unlucky foreigners have been caught and suffered tremendous inconvenience at the hands of notoriously unsympathetic authorities. This being a business trip, I had no desire to tempt fate for the sake of a few larvae in a group I don’t even study. 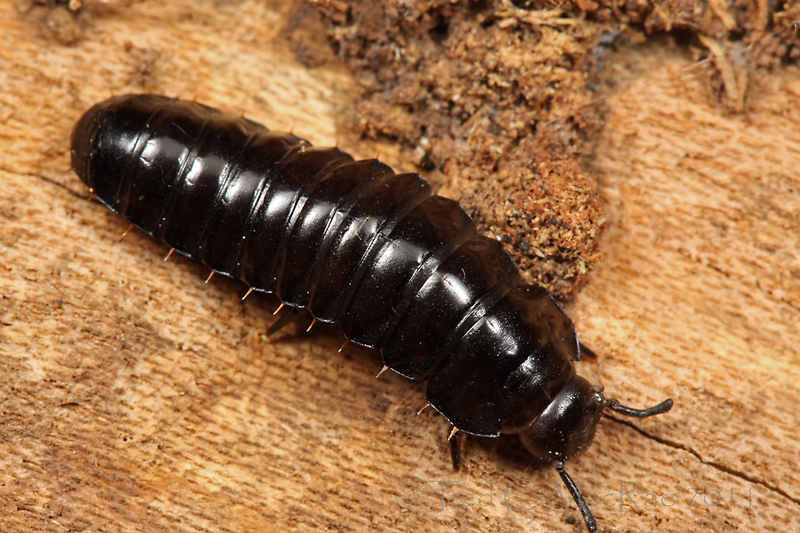 Despite a millipede-like appearance, six legs and loose cluster of ocelli indicate its true identity. After consulting all of the print and online resources at my disposal and failing to find a convincing match at even the family level, I began to second guess not only whether these were tenebrionids, but larvae or even beetles. I’m not aware of any tenebrionids with larviform adult females, but such are common in the Lampyroidea. That didn’t seem to fit, however, as the latter tend to be much more flattened and armored in appearance, and the round head is really unlike the elongate and narrow head so often seen in that group. The actually began to wonder if it was even a beetle – most xylophagous beetle larvae are light-colored and rarely so heavily sclerotized, and the antennae are unlike the typical 3-segmented antennae seen with most xylophagous beetle larvae. In fact, the antennae and the shape of the head actually reminded me of a millipede, but the obvious presence of six legs (and no more) made this untenable (even though 1st instar millipedes are hexapod, the large size of these individuals precludes them from being 1st instar anything). 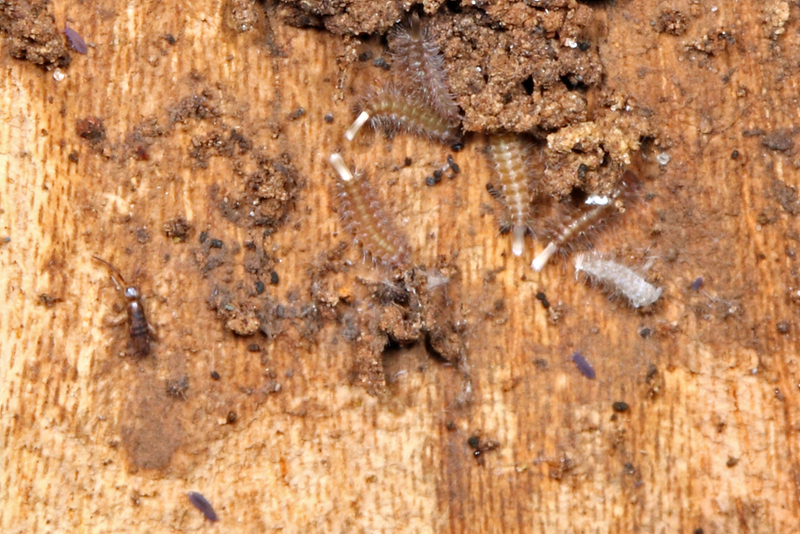 Eventually, I could only conclude that they were coleopteran – possibly a larviform adult, but more likely larval. As a last resort I sent photos to Antonio Santos-Silva, a coleopterist at the University of São Paulo. Although he specializes in Cerambycidae, I reasoned this might be a fairly common species since I had found good numbers on a single tree in an urban area near São Paulo, and as such it might be something he would recognize. Antonio quickly replied saying that he agreed it was the larva of a species of Tenebrionidae, with an appearance similar to the larvae of Goniodera ampliata (a member of the Lagriinae, formerly considered a separate family). I’ve not been able to find photos of the larva of Goniadera or related genera, but these do bear a striking (if more glabrous) resemblance to these presumed tenebrionid larvae from Australia. Until a more convincing opinion is forthcoming, Tenebrionidae seems to be the consensus. Although nobody zeroed in on Tenebrionidae for this challenge (#5 in the ID Challenge series), I must say that I enjoyed the diversity of opinion about what it might represent. Moreover, congratulations to those who ‘took nothing for granted’ and noted the presence of several other organisms in the photo – this is where the big points were to be earned, and several participants successfully ID’d what I take to be a number of poduromorph collembolans, a single entomobryomorph collembolan, a central cluster of polyxenid millipedes, and several indistinct but clearly coleopteran adults (see super crops above). David Hubble got the most correct answers to earn 15 points and the win in this inaugural post of BitB Challenge Season #2, while Dave and Troy Bartlett earned 13 and 10 points, respectively, to complete the podium. Seven other participants got in on the fun and earned some points – I hope you’ll join the fun next time, too! This entry was posted in Coleoptera, Collembola, Diplopoda, Entognatha, Polyxenida, Tenebrionidae and tagged beetles, Brazil, Brazil Bugs, darkling beetles, entomology, immatures, insects, millipedes, nature, science, springtails. Bookmark the permalink. Adult Goniadera ampliata are large for lagriines (exceeding 20mm in length), so the size is right. More votes for Tenebrionidae – Steven Lingafelter left a comment on my FB page wondering if this was a larviform adult female tenebrionid (although I’m still not aware of any such species). Moreover, Dra. Sônia Casari, also at the University of São Paulo and co-author with Dra. Cleide Costa of “Larvas de Coleoptera do Brasil” and in response to Antonio’s request for an opinion, also believes they are the larvae of “Tenebrionidae Lagriinae (Goniadera? ).” The only more conclusive opinion available would be if Cleide Costa herself (now retired) weighs in. I would just say more terrestrial isopod-like than millipede-like in appearance.